For the month of April, we had to do Tiramisu for our Eggless Baking Group. I had finished making it, way back by the 11th or 12th of the month, since I had to travel to the US. I was so happy that I had finished the challenge, way before the revealing date, and I had taken the camera with the pictures with me. But then, while travelling, I had left the camera at a friend's place, and came back only today, so once again, I am late for the post. Coming to the Tiramisu, we had to make our own mascarpone cheese, eggless savoiradi or lady fingers and then make it alcohol free too. Well, it was quite a challenge, but an interesting one and I think I have succeeded, at least 80%. I have tasted the regular Tiramisu with the eggs and the alcohol, and I can say, I have come closer to the original, except for the alcohol flavor in it. 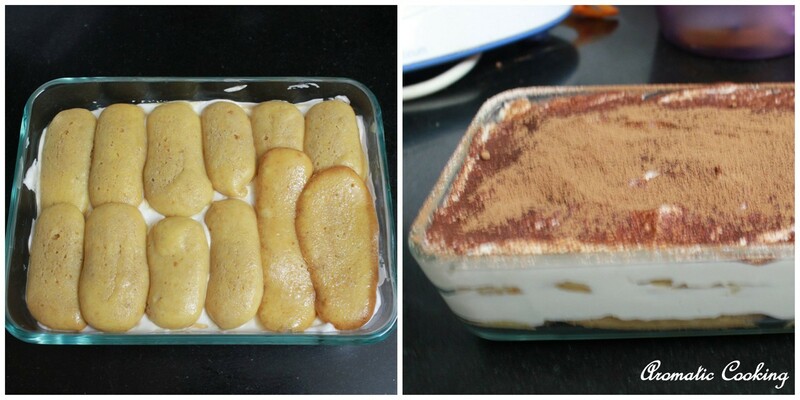 Anyways, I truly enjoyed making it and my family loved the eggless, alcohol free Tiramisu.. 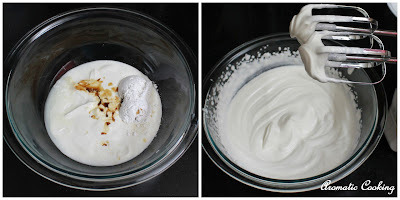 I referred Vimitha's procedure for making the Mascarpone Cheese and I used Amul Fresh Cream for making it. Heat some water in a shallow pan, place another vessel with the fresh cream inside the shallow pan, basically a double boiler. Keep stirring it, till you see light bubbles in the cream, at this stage add the lemon juice and keep stirring. You'll note a very slight curdling, or you can see the cream become a little grainy and coating the back of a spoon. Remove it at this stage, strain it in a cheese cloth, leave it for half an hour, then just fold the cloth over and leave the whole thing in the refrigerator overnight. Remove it from the cloth, can be stored for at least 4 days. Sift together the plain flour, corn flour, baking soda and baking powder. Take the oil orange juice, vanilla extract, salt and powdered sugar and beat well. Now add the sifted dry ingredients and mix well. It should be thick enough to be used in a piping bag or a ziploc bag. Take it in a ziploc bag, cut a little at the end and squeeze out small strips, about 2" to 3" long on a greased cookie sheet. Dust some icing sugar, leave it for a minute, again dust some icing sugar. Bake it at 200C for 8 to 9 minutes. Remove and cool. Take the fresh cream ( should be chilled), icing sugar and vanilla extract in a bowl and beat it for about 4 to 5 minutes till you get stiff peaks which holds. To the whipping cream add the mascarpone cheese and mix gently. Mix the coffee ( I had used 2 tablespoon of instant coffee powder for 1 cup water), orange juice and sugar, it should be slightly warm. Soak the savoiardi biscuits in the coffee solution, remove immediately and layer a square or rectangular glass dish with it, top it up with a layer of the mascarpone-whipping cream mixture. Then place another layer of the coffee soaked savoiardi, followed by the remaining cheese mixture. Cover it with a cling wrap and leave it to set in the refrigerator for at least 2 hours. Remove, dust it with some cocoa powder and serve. 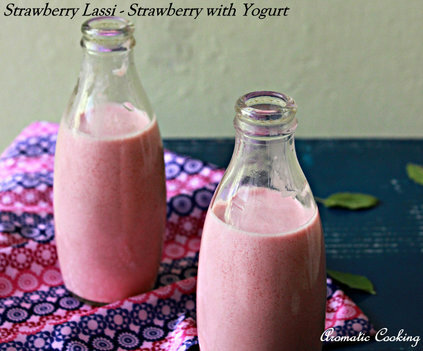 I have used Amul Fresh Cream, you can use any heavy whipping cream. The savoiardi biscuits are crispy on the top but soft on the inside, don't soak it too long in the coffee, it'll break and I got about 20 from the above quantity. Layer the glass dish with a cling wrap, before placing the savoiardi biscuits, that way it'll be easy to lift the whole thing out after it sets. Wow! from scratch is very impressive. I love tiramisu because of its lightness. I need a piece ..
oh wow...Mouthwatering here.....so tempting and delicious! 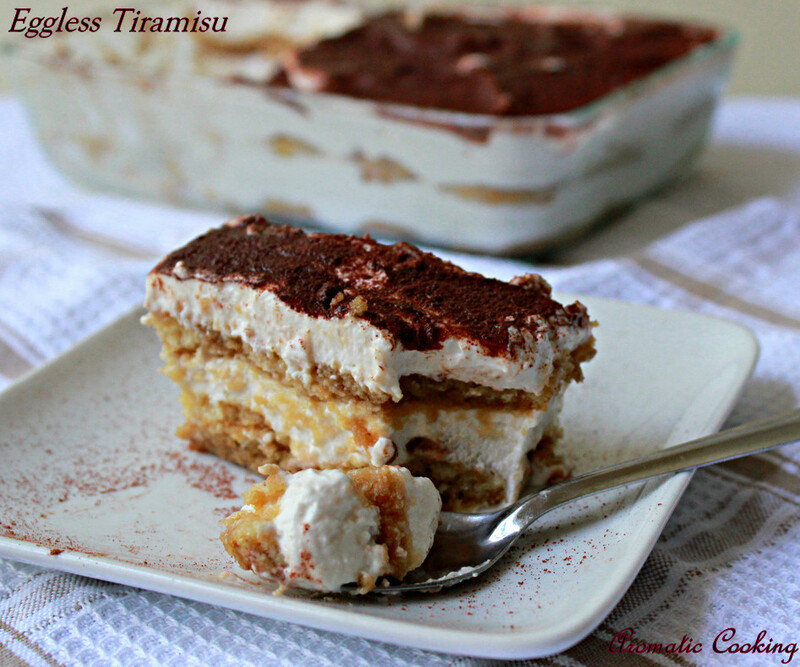 wow...eggless tiramisu sounds so delicious and looks perfect...can't wait to try it. 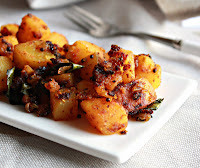 Tempting pics Hema! Wow that is very inviting, loved the orange flavour added to the dessert. Very well presented, awesome job! 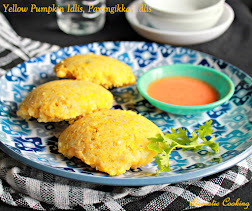 I'd love to try this eggless version; might be better that original-one! OMG ! What a creamy version... Love it ! Wow Tiramisu looks perfect and lovely.. Nice idea to add orange juice in coffee and biscuits too..would like to try your biscuits as you have made it with less fat. Lovely Tiramisu and nice eggless savoiardi recipe.. Loved the way you piped them.. Perfectly baked.. 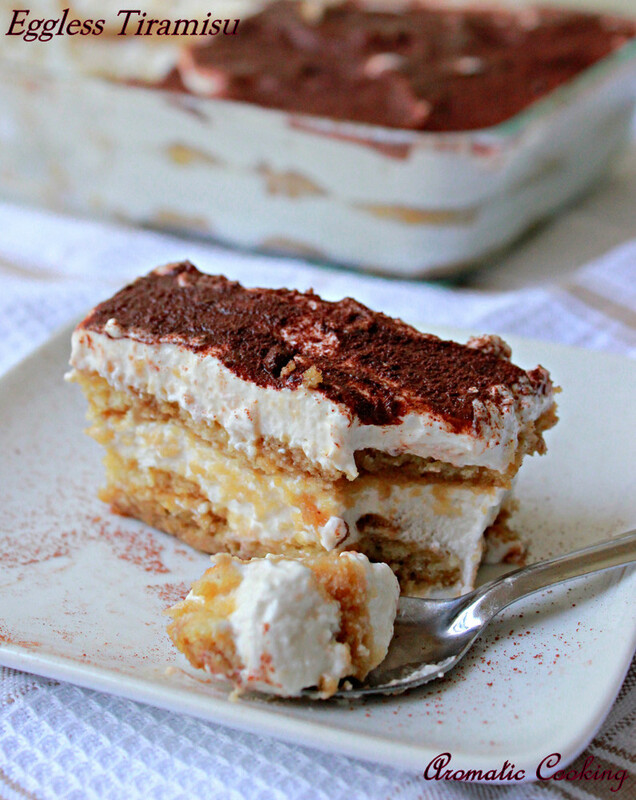 This is one of my favorite dessert.. You have made it so perfectly and explained it very well..
Wow...extremely yummy and wonderful Hema...I love the concept of tiramisu itself..You are making me drool here. shall i break my diet rule?irrestible n very tempting..
looks so perfect & tempting ! 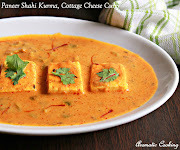 Love this egg less version,looks so yummy..bookmarked. 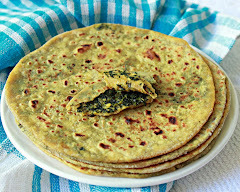 This recipe especially the eggless savoiardi biscuit is a keeper. Though I made Tiramisu for eggless baking group,I was not fully satisfied with the biscuits and it was crunchy even after soaking.Today I tried your biscuits and it came out perfect..Thanks for this lovely recipe. Tiramisu looks yummy, I have just one query that how do you make whipping cream from Amul cream. Somehow, it has never worked for me. I never get whipping consistency even after 10 min . Hi Tejaswini, if you use the electric beater and beat the cream with icing sugar, you'll get whipping cream. I loved your recipe. It was so easy to prepare and was delicious.